Graham Stanton Harrell (born May 22, 1985) is an American Football assistant coach and former American football and Canadian football quarterback. He is currently the offensive coordinator and quarterbacks coach for the North Texas Mean Green. He had been an assistant for the Washington State Cougars for the previous two seasons and had also worked for Oklahoma State in a quality control position . He played college football at Texas Tech University, where he was an All-American quarterback, Heisman Trophy finalist in 2008, and set school, conference and national records for passing yards, attempts, completions, and touchdown passes. Harrell was signed into the National Football League in 2010 by the Green Bay Packers. He won Super Bowl XLV with the Packers over the Pittsburgh Steelers. He was also a member the New York Jets. Prior to his time in the NFL, he was signed by the Saskatchewan Roughriders in 2009 as an undrafted free agent in the Canadian Football League. Harrell passed on entering the 2007 NFL draft. He continued the success of the previous season, mainly due to the addition of All-American Wideout Michael Crabtree and the emergence of inside receivers Danny Amendola and Eric Morris. The Raiders started the season off with wins over the SMU Mustangs 49-9, the UTEP Miners 45-31, and the Rice Owls 59-24. Harrell then had a career day against the Oklahoma State Cowboys throwing for 5 touchdowns and 646 yards, however due to the poor play of the Tech defense, the Raiders lost to the Cowboys 49-45. Harrell was still given recognition as the AT&T player of the week for his performance despite the loss. The Raiders then reeled off lopsided wins over Northwestern State, Iowa State, and Texas A&M pushing their record to 6-1 and into the national rankings. Harrell being mentioned as a dark horse candidate for the Heisman Trophy. The Raiders then dropped two games to Missouri and Colorado which knocked Tech out of the national conversation, but rebounded to beat Baylor 38-7. Harrell led the Red Raiders into Austin, Texas to face off against Colt McCoy and the Texas Longhorns, in a back and forth affair that Texas won 59-43 by simply outscoring Tech. The Raiders upset the # 4 ranked Oklahoma Sooners in Lubbock to finish the regular season 8-4 overall and 4-4 and third place in the Big 12 South. Tech was invited to the Gator Bowl where they knocked off a ranked Virginia Cavalier team 31-28 to finish 9-4 overall and ranked # 22 in the country. Harrell was named the game's Most Valuable player. He was then awarded the Sammy Baugh Trophy awarded to the best passer in College Football. He finished the season with a 71.8% completion percentage, throwing for 5,705 yards and 48 touchdowns. On October 25, 2008, Graham Harrell passed Philip Rivers to move into sole possession of third place for passing yardage in a career. On November 22, 2008, Harrell passed Ty Detmer to move into second for passing yardage in a career behind Timmy Chang. On January 2, 2009, Harrell played his final collegiate game, a 34-47 loss to Ole Miss in the 2009 AT&T Cotton Bowl Classic. In the game, Harrell finished his college career with an NCAA all-time record of 134 passing touchdowns, breaking the previous mark of 131 set by Colt Brennan. He also equaled Brennan's record of 147 career touchdowns passing, rushing, and receiving, a record that would be broken the following year by Central Michigan's Dan LeFevour. Harrell also compiled 5,111 passing yards in the season, becoming the first NCAA player to post multiple 5,000-yard passing seasons. Harrell signed with the Green Bay Packers on May 19, 2010. He was released on September 4, but was re-signed to the practice squad the next day. On December 18, Harrell was signed to the active roster due to an injury to Aaron Rodgers. On September 3, 2011, the Packers released Harrell, but they re-signed him on September 4, 2011, to the practice squad. On December 7, 2011, the Packers again signed Harrell to the active roster. After the departure of primary back-up Matt Flynn, Harrell was promoted to the active roster full-time and was named Rodger's primary back-up. On September 30, 2012, Graham played in his first game for Green Bay. Coming in for one snap in the red zone, Harrell took the snap to hand off to Cedric Benson, but was tripped by his center, resulting in a fumbled hand off and a lost fumble. Harrell hosted a weekly sports talk show called the "Witt Ford Red Zone with Graham Harrell" every Monday during the 2012 season on 104.1 FM WRLU and archived at DoorCountyDailyNews.com. Sam Harrell, Graham's father, was the highest paid high school coach in Texas as of the 2005-06 academic year. He coached at Reagan County (1990–1993) and Ennis (1994-2009) before retiring from coaching duties in December 2010 due to health problems. Sam returned to the sidelines after over 2 years of aggressive treatment for Multiple Sclerosis  and coaches in Brownwood under Bob Shipley, father of Jacksonville Jaguars and former Texas wideout Jordan Shipley. Sam currently is the offensive coordinator for the Fort Worth Christian High School Cardinals. Harrell has been married to the former Brittney Tomlinson of Tyler, Texas since March 2012. ↑ Harrell, Graham. "Texas, Birth Index, 1903-1997". FamilySearch.org. Retrieved 13 December 2013. ↑ Harrell, Graham. "Player Stats". NFL.com. Retrieved 13 December 2013. ↑ "Texas Beats Oklahoma in 67th Annual Oil Bowl". NFLHS.com. Retrieved 2007-05-11. ↑ "SchoolDay: Oh, brother!". Dallas Morning News. 2005-09-15. Retrieved 2007-05-11. ↑ "Lake Travis beats Longview, 48-23". ↑ "Texas High School Football Passing Career Touchdown Leaders". Lone Star Gridiron. ↑ "A truly Fabulous year for Lake Travis' Gilbert". 1 2 "Down 31, Texas Tech rallies for biggest bowl comeback". ESPN.com. 2006-12-29. Retrieved 2007-05-11. ↑ Wolff, Josh (2008-07-05). "Shaking the 'system' label". Pro Football Weekly. Retrieved 2008-11-09. ↑ "MU's Chase Daniel on Unitas Award watch list". ↑ "2008 O'Brien Quarterback Award Watch List Released" (Press release). ↑ "Big 12 notebook: Still more big games left". SportingNews.com. Retrieved 2008-11-07. ↑ "Harrell overtakes McCoy in Heisman poll". Austin American-Statesman. 2008-11-03. Retrieved 2008-11-07. ↑ "Harrell Among Unitas Finalists: Texas Tech senior quarterback one of 10 vying for prestigious award". Texas Tech Athletics. 2008-10-14. Retrieved 2008-10-19. ↑ "Harrell Among Unitas Finalists: Texas Tech senior quarterback one of 10 vying for prestigious award". KSCW. 2008-10-27. Retrieved 2008-10-27. ↑ "Just another TT QB? No, Harrell is a shock to the system". ↑ "Texas Tech: Harrell Named AT&T All-America Player of the Week". NCAA. 2008-09-04. Retrieved 2008-09-05. ↑ Price, Dwain (2008-10-07). "Texas Tech: Graham Harrell named the Big 12 Offensive Player of the Week". Retrieved 2008-10-07. 1 2 "Harrell named O'Brien Quarterback of the Week". NCAA. 2008-10-07. Retrieved 2008-10-07. ↑ "Harrell, Lewis and Williams Named Big 12 football Players of the Week". Big 12 Conference. 2008-10-27. Retrieved 2008-10-27. ↑ "Dreams of Harrell, Texas Tech come crashing down". ↑ "Harrell has pins, plates put in left hand; should be fine for bowl". 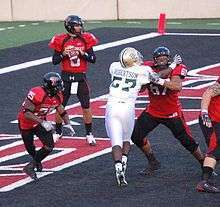 1 2 "Texas Tech's Harrell Headlines 2008 AFCA Coaches' All-American Team". American Football Coaches Association. 2008-12-04. Retrieved 2008-12-04. ↑ "'Oklahoma's message soundly delivered with destruction of Texas Tech". ↑ "Bold Miss: Texas Tech no match for Rebels, 47-34". ↑ "2006 Academic All-Big 12 football Team Announced" (PDF) (Press release). Big 12 Conference. 2006-11-21. Retrieved 2008-11-26. ↑ "2007 Academic All-Big 12 football Team Announced" (PDF) (Press release). Big 12 Conference. 2007-11-20. Retrieved 2008-11-26. ↑ "Texas Tech Red Raiders, NCAA Football, Virginia Cavaliers". CBSSports.com. Retrieved 2010-12-28. ↑ "2008 Academic All-Big 12 football Team Announced" (PDF) (Press release). Big 12 Conference. 2008-11-25. Retrieved 2008-11-26. ↑ "NFF Scholar-Athlete Bio". National Football Foundation. Retrieved 2011-11-30. ↑ "Graham Harrell Wins Johnny Unitas Golden Arm Award". Official Texas Tech Athletic Site. 2008-12-08. Retrieved 2008-12-09. ↑ "Harrell 2008 Johny Unitas Golden Arm Award" (PDF). ↑ "Sooners' Bradford Wins Heisman Trophy". ↑ "Texas Tech QB Harrell named co-national player of the year". The Dallas Morning News. 2008-12-17. Retrieved 2008-12-18. ↑ "Harrell Selected AT&T All-America Player of the Year". Texas Tech Official Athletic Site. 2009-01-09. Retrieved 2009-01-09. ↑ Williams, Don (2009-04-26). "Chargers land Vasquez, Cowboys take Williams". Lubbock Avalanche-Journal. Retrieved 2009-04-27. ↑ Cabot, Mary Kay (2009-05-04). "Browns Insider: No deal for QB Harrell, but coaching staff was positive, says agent". The Plain Dealer. Retrieved 2009-05-13. ↑ "Rex Grossman, Graham Harrell to the UFL". ↑ "Riders sign Quarterback Graham Harrell". Saskatchewan Roughriders Football Club. 2009-07-20. Retrieved 2009-07-20. ↑ "Riders release QB Harrell, WR Morris". cfl.ca. April 22, 2010. Retrieved 22 April 2010. ↑ Allen, Eric (28 August 2013). "QB Graham Harrell Added, C Dalton Freeman Released". New York Jets. Archived from the original on 28 August 2013. Retrieved 28 August 2013. ↑ Lange, Randy (2 September 2013). "Jets QB Rotation: Brady Quinn In, Harrell Out". New York Jets. Archived from the original on 2 September 2013. Retrieved 2 September 2013. ↑ "In dollars, coaches beat teachers". Austin American-Statesman. August 27, 2006. p. A1. Retrieved 2009-02-25. ↑ Harrell, Sam. "Sam Harrell demonstrates his progress after receiving umbilical cord stem cells + fat stem cells for multiple sclerosis". CellMedicine.com. Retrieved 13 December 2013. ↑ George, Brandon. "Ennis ISD official release on football coach Sam Harrell retiring from coaching". Dallas Morning News High School Sports Blog. Retrieved 27 December 2010. Wikimedia Commons has media related to Graham Harrell.